Built on the pillars of transparency, honesty, and doing what’s right for small business. And we mean that. We’re working for small businesses every day, providing responsible working capital solutions tailored specifically for your business. We know each customer carries a unique story, and with dozens of different forms of working capital available in the market, the “one size fits all” approach utilized by many of our competitors leaves many small businesses fighting an uphill battle with a product that doesn’t match their business. We also understand that capital alone isn’t enough, which is why we regularly produce important educational resources for you. But we don’t stop there; we are constantly working as your advocate, to ensure that small businesses across the country continue to have access to alternative forms of working capital that are transparent, affordable, and free of predatory practices. Our tagline says it all: Empowering Small Business. We want to put the financial control back into the hands of small business owners and allow you to focus on what you do best: running and growing your business. Leveraging product innovation and a steadfast conviction to “do the right thing”, we set out to create suitable working capital solutions for small businesses based on three characteristics: flexibility, transparency, and affordability. This isn’t just “step A to step B”, but an ongoing responsibility that will continue to drive us to improve as a business. We also recognize that our core products will not always be the right solution for every company. So we’ve developed a revolutionary Suitability Test that we apply to all of our potential customers. What exactly does that mean? Well, when you apply for working capital with us, we will learn your business and your objectives, and only recommend the best product (or products) for your business, not the best product for our business. In cases when the right product is not with us, we will help you access the right solution through pre-approved partners that share our core principles. We supplement our on-going product innovation with a dedication to provide industry leading educational resources. Our resource center contains our highly regarded educational blog series, Breakout Bites, and additional resources like our APR and Double Dipping Calculator, all intended to help small businesses better understand the alternative lending market and how to avoid the hidden fees and debt traps that are too prevalent with many of our competitors. There is a significant amount of misinformation throughout the industry, and we help you sift through the “noise.” Additionally, we’ve formed partnerships with recognized thought leaders and small business advocates for you to leverage their expertise. In addition to becoming one of the fastest growing companies in the market, Breakout Capital is a leading advocate for small business. Our CEO is an active thought leader on Capitol Hill, promoting improved transparency and the adoption of “best practices” by alternative capital providers throughout the market.We are a Board Member of the Innovative Lending Platform Association (ILPA), a group of lenders, small business organizations, and small business advocacy groups dedicated to advancing best practices and standards that support responsible innovation and access to capital for small businesses. Through the ILPA, we are a SMART BoxTM adopter – a model pricing disclosure and comparison tool that will enable small businesses to better assess and compare their finance options. View our Best Practices & Code of Ethics. 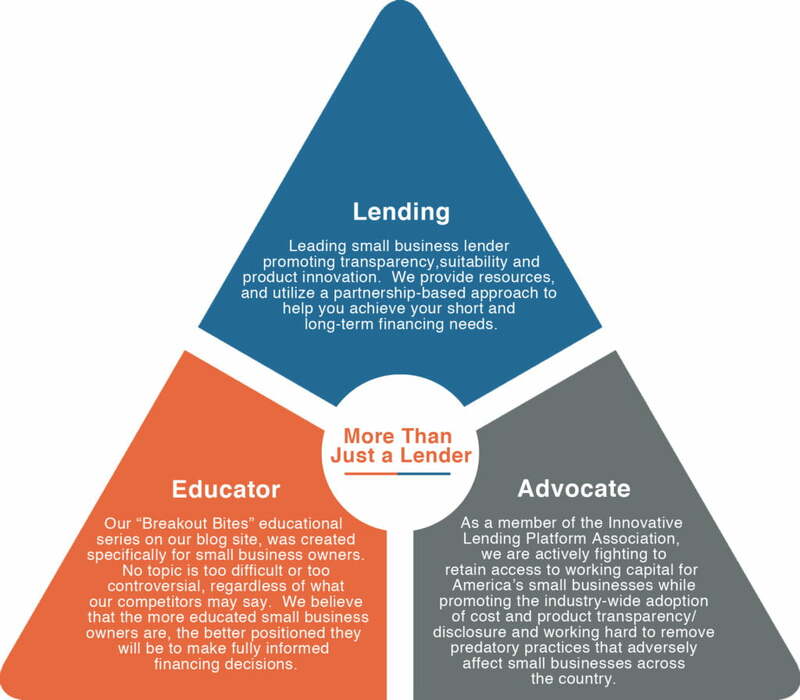 We are also on the task force for The Partnership for Lending in Underserved Markets (PLUM) led by the SBA and Milken Institute, in an effort to increase access to affordable capital for minority-owned businesses.